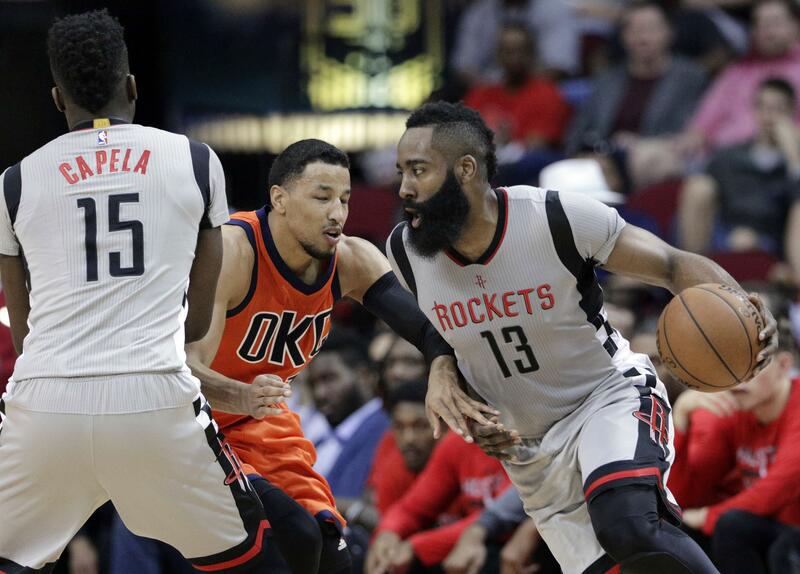 Sun., March 26, 2017, 9:58 p.m.
HOUSTON – Lou Williams scored 31 points, James Harden finished with 22 points and 12 assists, and the Houston Rockets cruised to a 137-125 victory over the Oklahoma City Thunder on Sunday. Oklahoma City star Russell Westbrook had 39 points, 11 rebounds and 13 assists for his second straight triple-double and his 36th this season, but Harden led the Rockets to a 25-point lead through three quarters in the matchup between top MVP candidates. Trevor Ariza and Eric Gordon added 24 points apiece for the Rockets, whose lead was trimmed to eight on a 3-pointer by Westbrook with about 90 seconds left. The Rockets then scored four quick points to secure the victory. Harden left late in the game after crashing into the court and appearing to injure his left wrist, but said in a TV interview he expected to be fine. BOSTON – Isaiah Thomas scored 30 points, including 20 in the second half, and Boston beat Miami for its fourth straight victory. The win moved Boston (48-26) within percentage points of Cleveland (47-25) for the top spot in the Eastern Conference. The Celtics also equaled their win total from last season. Jae Crowder added 25 points and six rebounds for the Celtics. Tyler Johnson had 24 points and James Johnson scored 20 for the Heat, who are a half-game ahead of the Bulls for the final playoff spot in the East. Hassan Whiteside had 19 points and 15 rebounds for Miami. OAKLAND, Calif. – Klay Thompson scored 21 of his 31 points in the second half and Golden State pulled away in the fourth quarter to beat Memphis for its seventh straight win. Stephen Curry added 21 points and 11 assists, and Andre Iguodala scored 20 as the Warriors (59-14) extended their lead to 2 1/2 games over the Spurs for the top spot in the West. Golden State began a stretch of five games in eight days when the Warriors will face playoff contenders Houston (twice), San Antonio and Washington. Memphis had beaten the Warriors twice this season and was attempting to become the first team to notch three regular-season wins against Golden State since the Spurs’ four-game sweep in 2013-14. The Grizzlies stayed close until the fourth quarter, when their offense went cold and the Warriors took off. Memphis missed 15 of its first 17 shots in the period. Mike Conley scored 29 points for the Grizzlies, who were without center Marc Gasol (left foot strain). LOS ANGELES – Damian Lillard scored 22 points and Portland defeated Los Angeles to pull even with Denver in the race for the final Western Conference playoff spot. Both the Trail Blazers and Nuggets are 35-38 with nine games left in the regular season. They play each other Tuesday in Portland. Portland took control by outscoring the Lakers 37-24 in the third quarter and led by as many as 26 points. Los Angeles shot 39 percent from the field and was outrebounded 61-42. Allen Crabbe added 18 points off the bench for the Blazers, and Noah Vonleh grabbed 14 rebounds. D’Angelo Russell led the Lakers with 22 points. DENVER – Anthony Davis had 31 points and 15 rebounds, helping to compensate for the absence of injured DeMarcus Cousins, and New Orleans boosted its flickering playoff hopes by beating Denver. New Orleans is in 11th place in the West with nine games remaining and faces long odds in trying to overtake Dallas, Portland and Denver for the No. 8 seed. Davis had his 45th double-double of the season and finished with 30 or more points for the 32nd time. Jrue Holiday and Jordan Crawford added 13 points apiece for the Pelicans, who have won four of five. Cousins sat out because of a right ankle injury sustained during Friday’s loss at Houston. Denver was led by Mason Plumlee’s 16 points. MILWAUKEE – Nikola Mirotic tied a season high with 28 points, Jimmy Butler had 20 points and a career-high 14 assists, and the Bulls pulled away for the win. Butler broke his previous career best for assists (12) by the end of a pivotal third quarter, when Chicago stretched a one-point lead at the half to 91-79 going into the fourth. Butler punctuated the second-half runaway with a backcourt steal off a telegraphed pass by Greg Monroe before strolling the other way for an easy dunk and 17-point lead with 8:55 left. Giannis Antetokounmpo had 22 points and eight rebounds for Milwaukee. LOS ANGELES – Willie Cauley-Stein made a follow shot with two seconds left, lifting Sacramento to the road win. Down 85-67 early in the fourth, the Kings rallied while Blake Griffin, Chris Paul and DeAndre Jordan were resting. Buddy Hield hit three 3-pointers in the final minutes, pulling the Kings to 96-93 with 2:10 to play. Griffin made one of two free throws with 1:57 left before the Kings cut it to 97-96 on Langston Galloway’s 3-pointer with 1:23 to play. After Jamal Crawford missed a 3-pointer, Cauley-Stein finished off a fast break with the deciding basket. Darren Collison led the Kings with 19 points. Hield added 15 as the Kings snapped a four-game losing streak and won for only the third time in 15 games. DeAndre Jordan led the Clippers with 20 points and 11 rebounds. CHARLOTTE, N.C. – Kemba Walker had 31 points and nine assists, and Charlotte handed Phoenix its eighth straight loss. Marvin Williams added 21 points and Nic Batum had 18 points and 10 assists for the Hornets, who have won four of their last five games as they try to make a late playoff push. Suns guard Devin Booker, who became the sixth player in NBA history to score 70 points in a loss Saturday night to the Boston Celtics, got off to a slow start but finished with 23 points on 7-of-17 shooting. TJ Warren had 21 points and 10 rebounds. Walker went 10 for 18 from the field and 7 for 7 at the free-throw line. ATLANTA – Brook Lopez scored 23 points and Brooklyn handed Atlanta its seventh straight loss. Jeremy Lin had 19 points for the Nets (16-57), who have won three of four and are 7-8 in March. The Hawks are tied with Milwaukee for fifth in the Eastern Conference. Atlanta (37-36) continued to struggle without All-Star Paul Millsap, who missed his fifth straight game with left knee tightness. The Hawks also were without Kent Bazemore, who missed his fourth straight game with a right knee bone bruise, and Thabo Sefolosha (right groin strain). Dennis Schroder led Atlanta with 24 points. INDIANAPOLIS – Myles Turner had 17 points and 16 rebounds, Paul George scored 21 and Indiana topped Philadelphia. Jeff Teague added 16 points for the Pacers, who used a 30-point third quarter to turn a six-point halftime lead into a 12-point advantage as they snapped a two-game skid. Indiana (37-36) moved into a tie for fifth place in the Eastern Conference with Atlanta and Milwaukee. The Pacers will play both the Bucks and Hawks during their final nine games of the season. Al Jefferson had 14 points before leaving in the fourth quarter with a sprained ankle. Sergio Rodriguez scored 16 for the 76ers. Richaun Holmes finished with 11 points and 11 rebounds. Published: March 26, 2017, 9:58 p.m.